It was a long, long night, crossing the water from Newfoundland back to Cape Breton. Jim had reserved seats in the recliner chair section. Most of the seats on board the ferry are really uncomfortable for sleeping. I suppose that’s their way of encouraging people to reserve cabins. The recliners allowed us to stretch out, but were still uncomfortable. Worse were the crying children--a baby and a two year old--who whined and cried all night. Jim and I gave up any attempt to sleep at 1:30 or so. Every time we’d start to nod off, the kids would start screaming again. We’d have done better to ignore the rule against sleeping on the floor. Better still would have been to sleep on the floor in another room. It would have helped to bring blankets as well. Our last ferry was really hot and stuffy; this one was freezing. Perhaps the tropical storm raging outside had something to do with that. Getting off the ferry this morning in pouring rain and high wind wasn’t fun. We stopped at Tim Horton’s for breakfast, then headed up the Trans-Canada highway to Baddeck. The cliffs were covered with waterfalls from the rain. We couldn’t even see Bras d’Or Lake through the thick clouds. Given the conditions, we only drove as far as Baddeck, where we got a room at the Trailsman Motel where we stayed previously. By 8:30 a.m. we were settled in, warm and dry. Of course, the storm stopped soon afterwards, but the wind continued to blow for several hours. Jim and I took a short nap, which helped enormously, then we read the rest of the afternoon. It was a travel day, not particularly interesting. The sky was gray and gloomy for the most part, though the sun came out occasionally and it never actually rained on us. 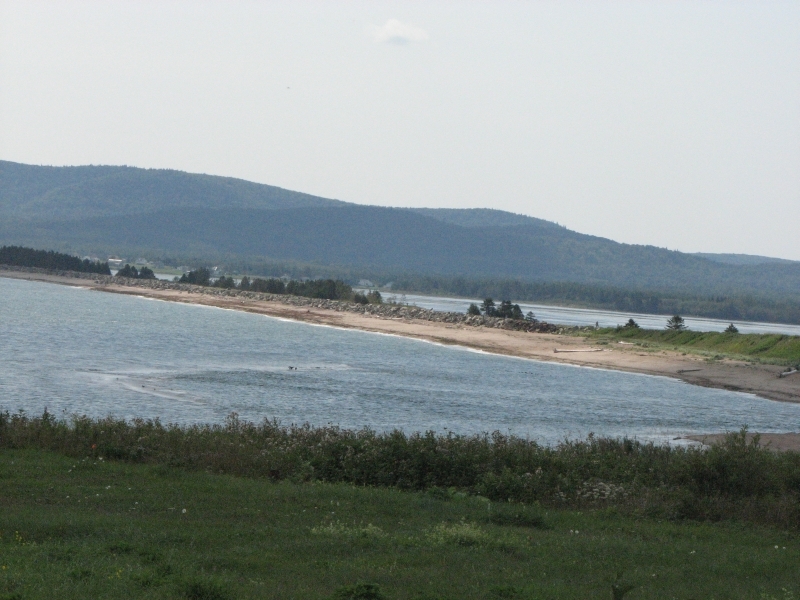 We are heading to the Gaspé Peninsula in Southeastern Quebec and Jim didn’t want to detour much, so we stayed on the main highways and made pretty good time. Driving Nova Scotia’s back roads can be very slow, though I enjoy the rural and coastal landscapes. Late afternoon, we stopped at Parlée Beach Provincial Park which has a large campground a half mile or so from the beach. We walked to the beach after checking in, but didn’t linger because the wind was whipping the sand into a real sandstorm. The campground has trees so we had the illusion of privacy and they blocked the wind pretty well. Jim and I followed the coast for a while, driving through a couple of resort towns. Jim’s comment was, “It looks just like New Jersey.” When road work forced us back to the main highway, I wasn’t unhappy. After the wild country we’ve seen the past few weeks, the tourist circus was less than appealing. 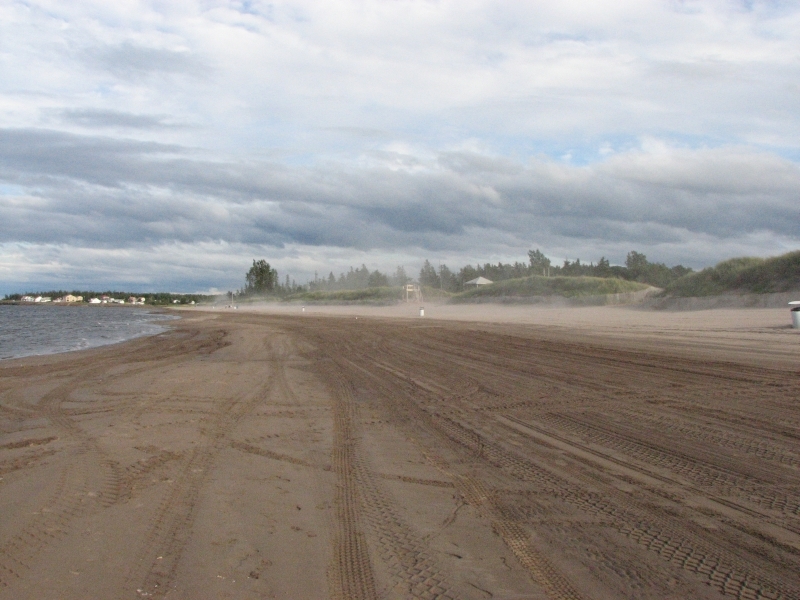 We left the main highway a few miles before reaching Kouchibouguac National Park. We weren’t sure whether we’d even stop there, since we knew nothing about it except the name on the map. As national parks go, it’s a fairly small one. There are a couple of nice rivers to fish or canoe, a long beach with grass-covered sand dunes, several long bike trails, a few short hiking trails and two campgrounds. Since it was a beautiful cool (65 degrees) sunny day, we decided to stop a while. My first thought was to try another canoe trip, but it was windy enough we were uncertain about how we’d do. Besides, the Park Warden told us that there were gray seals on the far end of Kelly’s Beach. The canoe rental person said that was too far to paddle in a few hours (3 hours each way, supposedly) but we could walk there easily. It was only a 6 or 7 km. walk each way (3½ to 4 miles) and we knew we had time to do that before suppertime, so we headed up the beach. 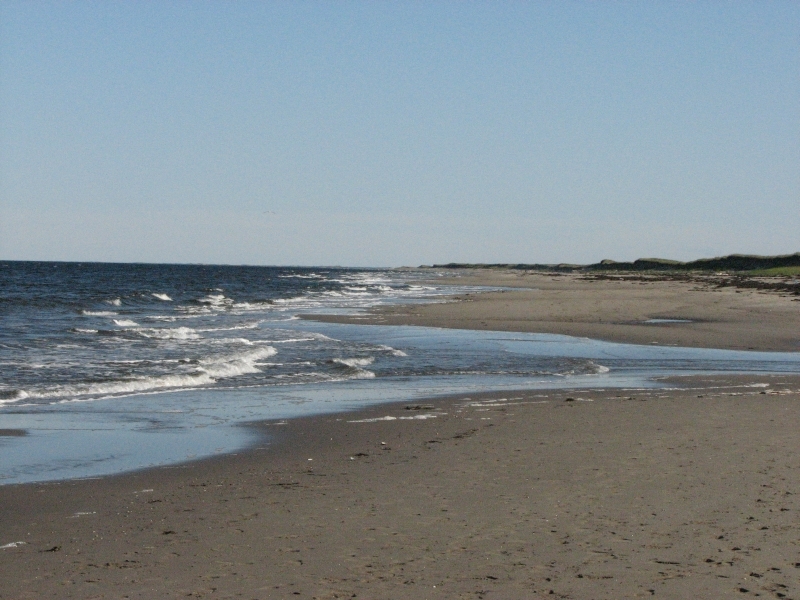 Kelly’s Beach is actually a barrier island that has ocean on one side and a lagoon on the other. 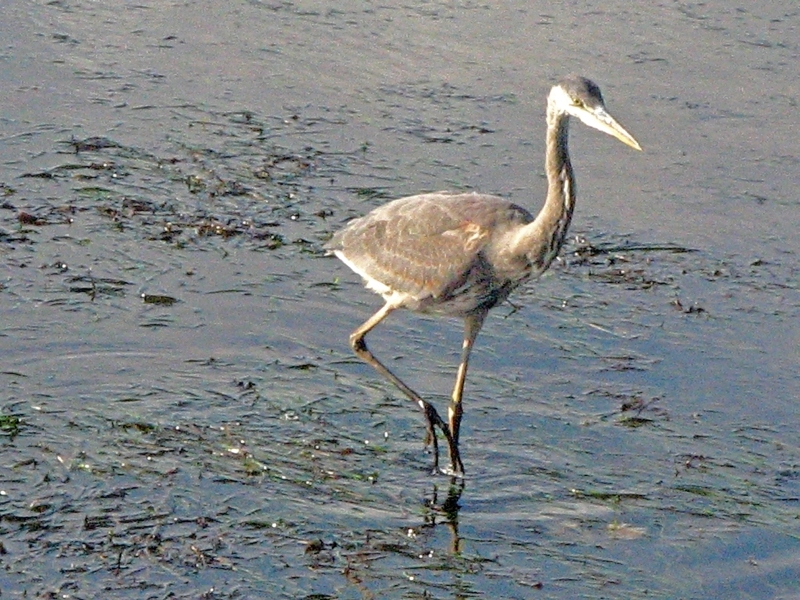 We saw more than a dozen blue herons on the lagoon side and a Red Tail Hawk. 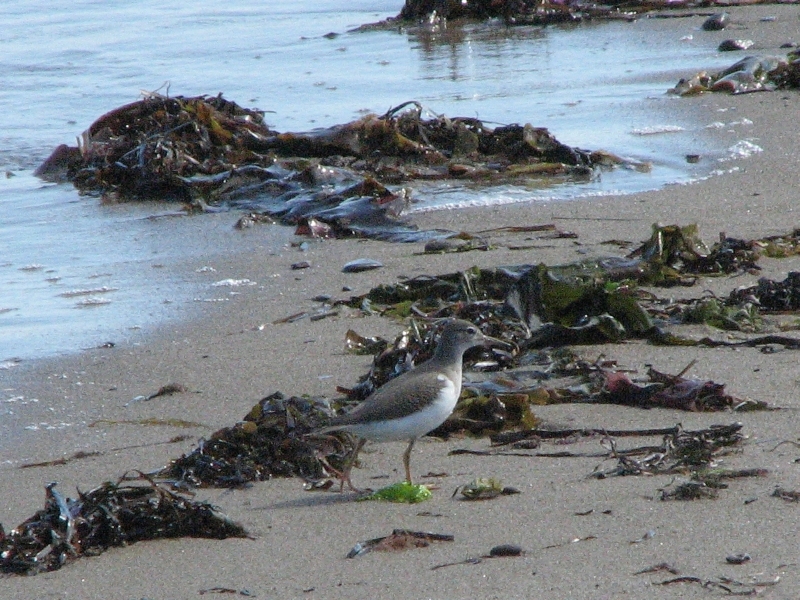 On the beach there were plovers and sandpipers and gulls. 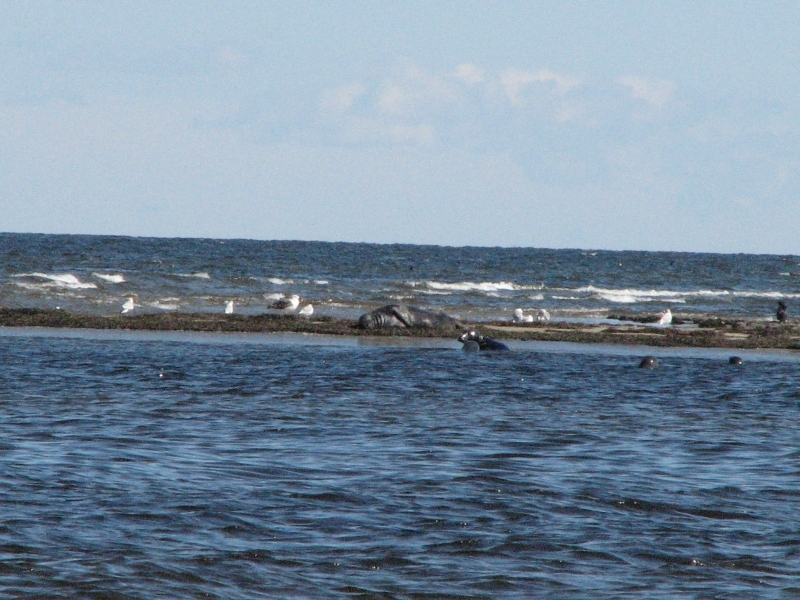 After about 2 ½ to 3 miles, we started seeing dark heads in the water: the seals were hunting. Jim and I walked all the way out to the end of the sand bar, seeing dozens of seals 25-50’ out in the water. At the end of the island, we sat down for a while. On the far side of an inlet was a sand bar. While we watched, a huge bull seal pulled himself out of the water and lay down, scratching and yawning. Other seals approached him, but hesitated to leave the safety of the water. 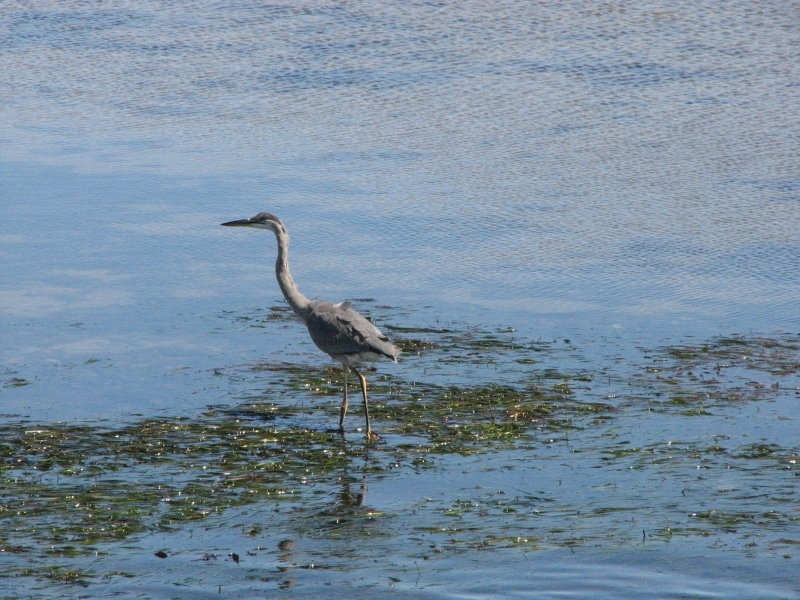 There were several fishing boats passing nearby and walkers on both sides of the inlet. Occasionally, one or two seals would climb out on the sand bar, but then they would hear a boat engine or voices and they would all dive back in the water, except for Big Daddy, who was enjoying his rest too much to move. At one point I counted 13 seals hovering nearby, waiting to go on shore. Since they didn’t seem ready to relax and bask in the sun for a while, (e.g. pose for pictures) we decided to turn around and head back. There were several other people walking the length of the island, but we had the beach to ourselves for long stretches, which was nice. 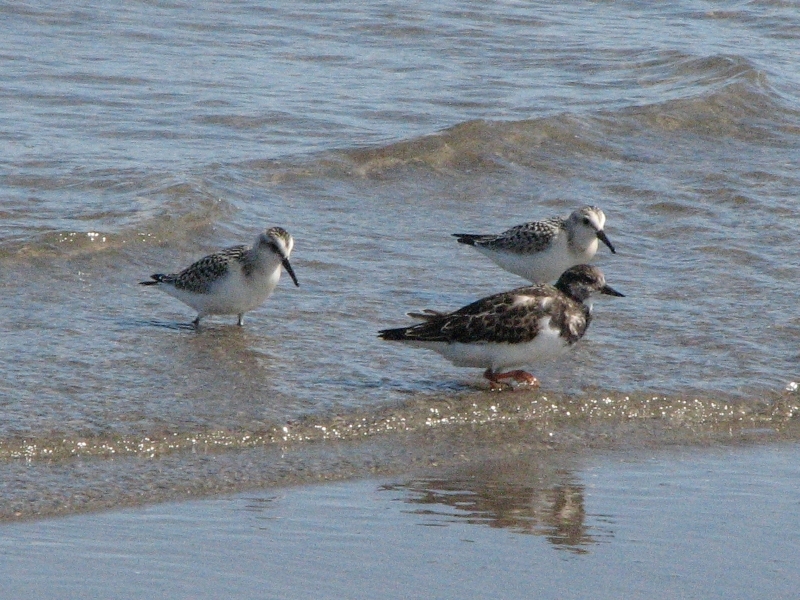 It was a nice hike on the beach, looking at birds and sea shells, watching the tide roll in. I’ve done more beach walking this year than I’ve ever done before. It’s different, but it’s nice. We watched a dozen fishing boats heading to port. Evidently it’s lobster season here. 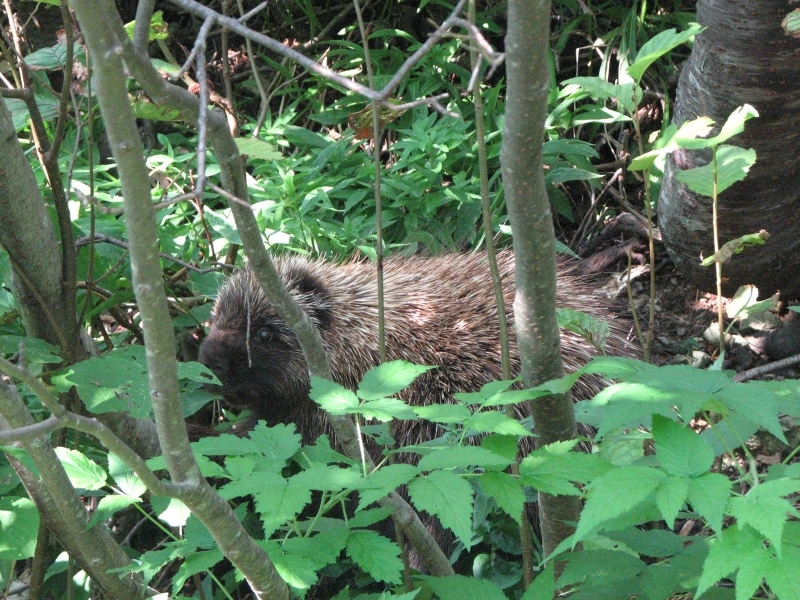 They started trapping about the same time the season ended in Newfoundland and Nova Scotia. Evidently you can get lobster really cheap right now by buying off the dock. I wasn’t that interested, but we met a couple who were planning to rent a canoe so they could go to the dock across the river to buy a couple of freshly caught lobsters. I’m not sure if they were informed they could also drive there. Jim and I decided to camp at the more primitive campground across the river. It has views over the water and nice wooded campsites. When we arrived, there were only a few campsites occupied, but by 7:00 we were surrounded by RVs. Another beautiful sunny day, but autumn is in the air. 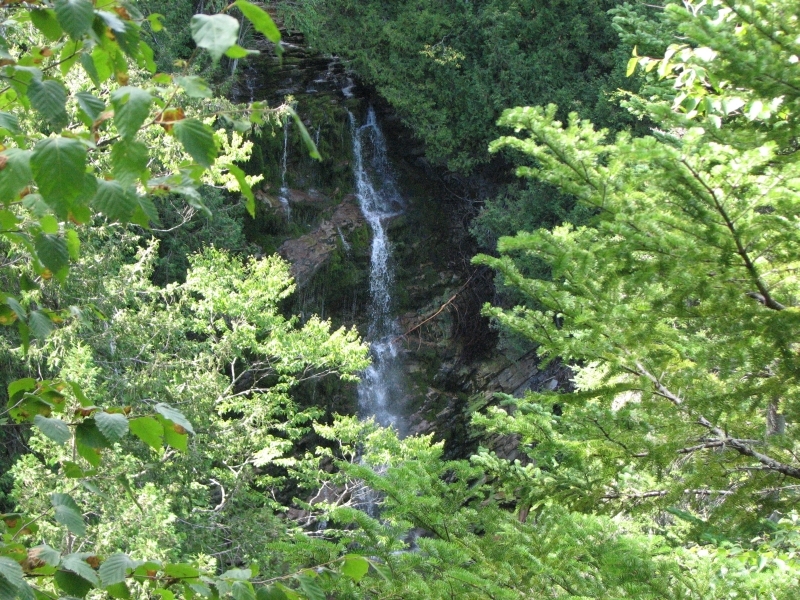 The lush ferns are turning brown; the trees are beginning, little by little, to change color. The abundant roadside wildflowers are fading and the grasses are starting to die. In the fields, farmers are mowing hay and corn stalks are ready for harvest. Change of seasons is nigh. We started the day with a drive back to the visitors’ center to pay for last night’s campsite, since there was nobody at the campground to take our money. Being fundamentally honest, we drove the 15 minutes or so back to hand over $15.70. Then we went for a short but nice hike on the Claire Fontaine Trail which follows a creek for a while before looping back along the Kouchibouguac Lagoon. It was a pretty walk through lush forest with occasional views of the water. We saw no wildlife, but there were fresh bear and moose tracks in the mud. 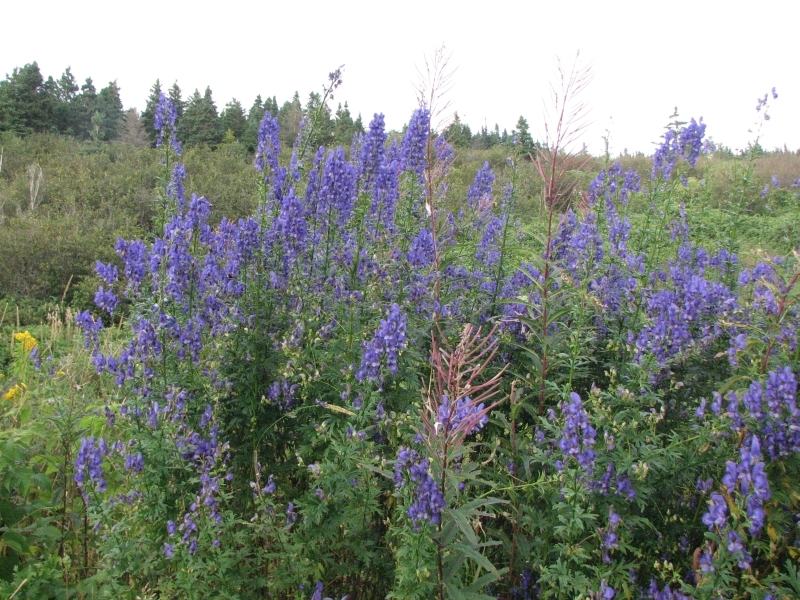 We then followed the Acadian Scenic Drive along the coast as far as Miramichi: again dense forest, flowery meadows, rivers, and views of the Gulf of St. Lawrence. Many of the houses had Acadian flags, but otherwise the villages didn’t look very different from the English ones in Nova Scotia or Cape Breton. One odd sight was a road roller that had fallen off the roadbed and was lying on its side. Construction was halted until they could get it upright again. It wasn’t very big, but they are heavy beasties. The farther north we went, the stronger the French influence. Bilingual French/English signs are normal all over Canada (we’ve also seen signs in Gaelic and Mi’kmaq), but as we approached Quebec, many of the signs were only in French. Telephone poles were painted in the Acadian design and restaurants were predominately French, not English. Once we crossed into Quebec, most of the English signs disappeared completely. My French is very rusty, so the next week should prove interesting. We ended up at a campground in Caplan. The owner speaks only French. I misunderstood his directions and we ended up stuck on the rocky beach. The owner had to tow us out, then he pointed to the camping area he had really intended for us. (He told me we would be right next to the Bay; I took him literally.) Oh well, we survived with only a small loss of face. 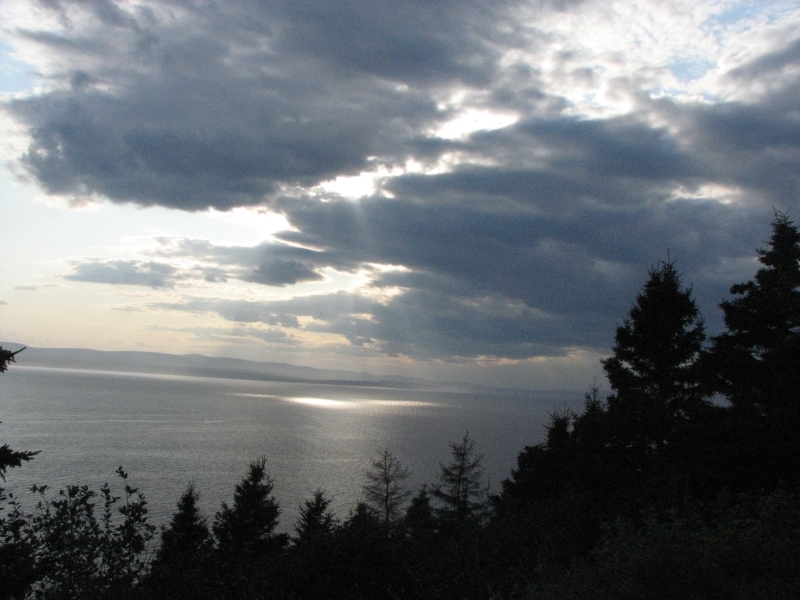 We continued our drive along the south coat of the Gaspé Peninsula, heading east. We passed some big resort towns with lots of motels, restaurants and shops, as well as some natural coastline with rocky beaches and sandbars. Because of all the development, the drive was slow. Road construction didn’t help. 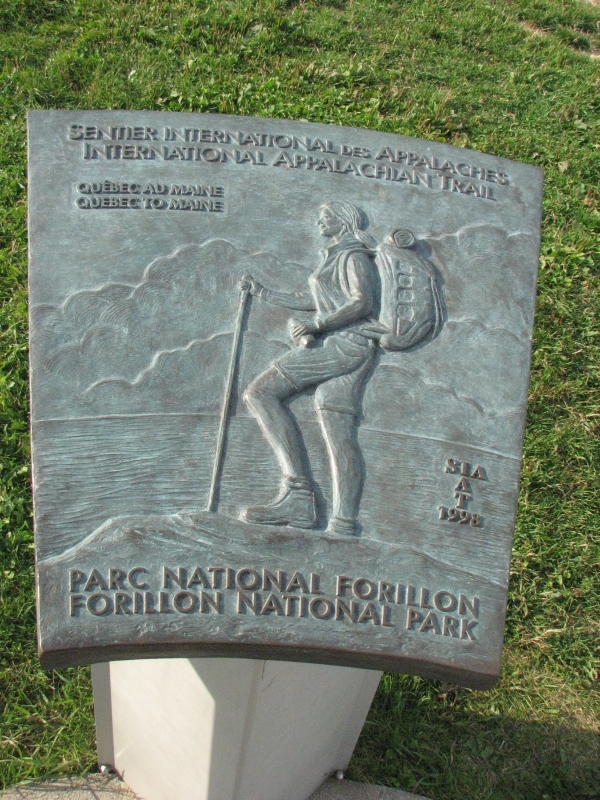 We reached Fourillon National Park around 2:30. 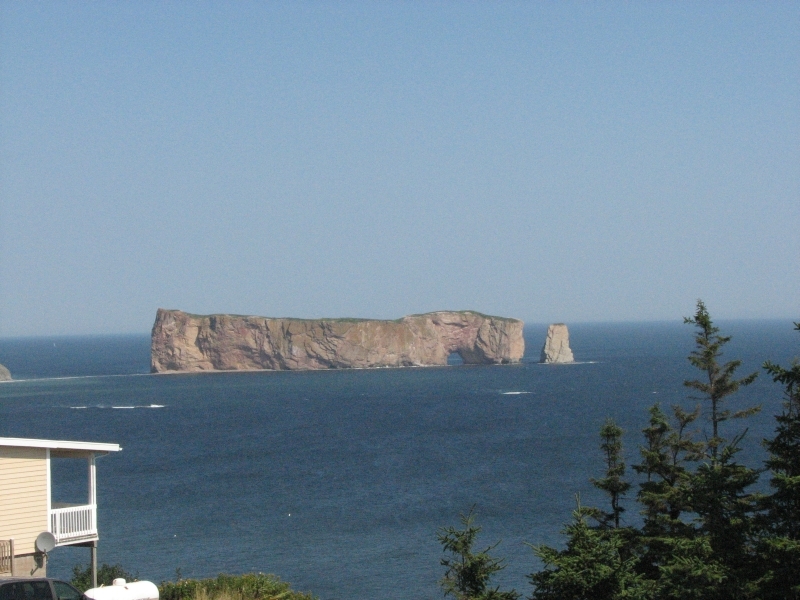 Our only stops along the way were for gas, a few groceries, and a lunch stop at a nice viewpoint looking out at Pierced Rock/Rocher Percé. There is another national park out on an island nearby, but we decided to skip it this time around. 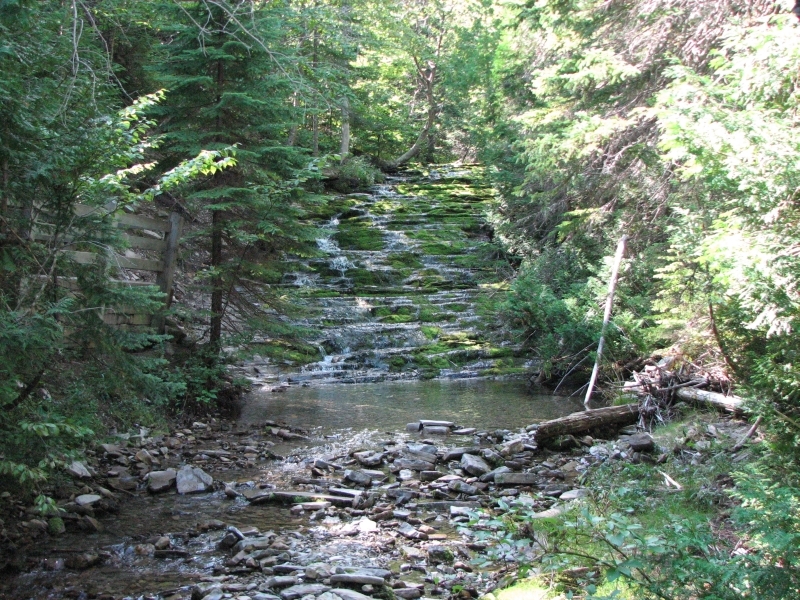 Quebec has 24 national parks. 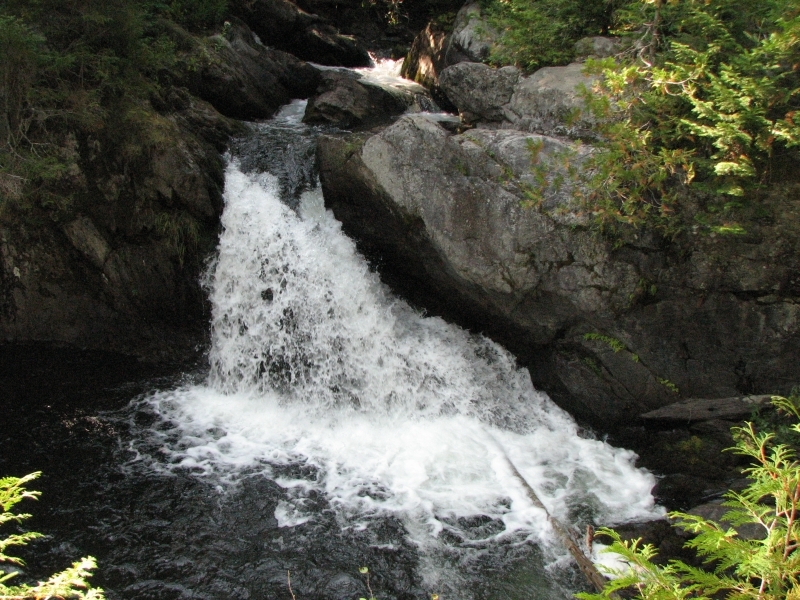 Most are historic sites, but four are nature sites. We had an annual pass for the nature-type parks that we purchased last August, but have been paying as we go for the historic sites. It adds up quickly. There’s a fossil site nearby that also looked interesting, but time is short and so is our money. Our annual pass expired at the end of the month, so we’re spending less time (and money) in the parks now that we have to pay a per day/per person fee. 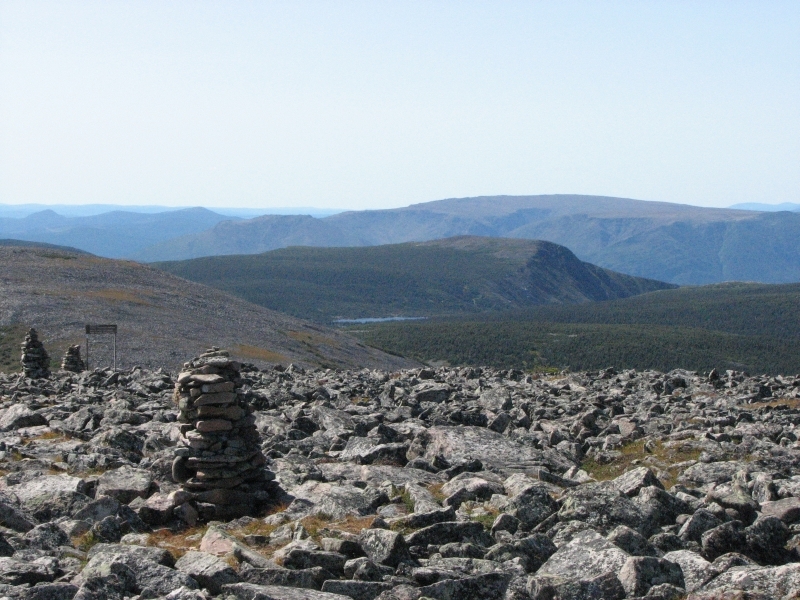 Instead of the three days we spent in Gros Morne and Kejimkujik, we’re only spending one night in each park. They are definitely worth visiting, but it gets expensive. Buying the annual passes is really a good idea when you visit Canada. I wish we had bought the pass for the historic sites, but we didn’t realize how many we would visit. We’ve gotten spoiled in the US, where one pass is good for all the historic sites as well as national parks and monuments. As the day progressed, dark clouds built up. 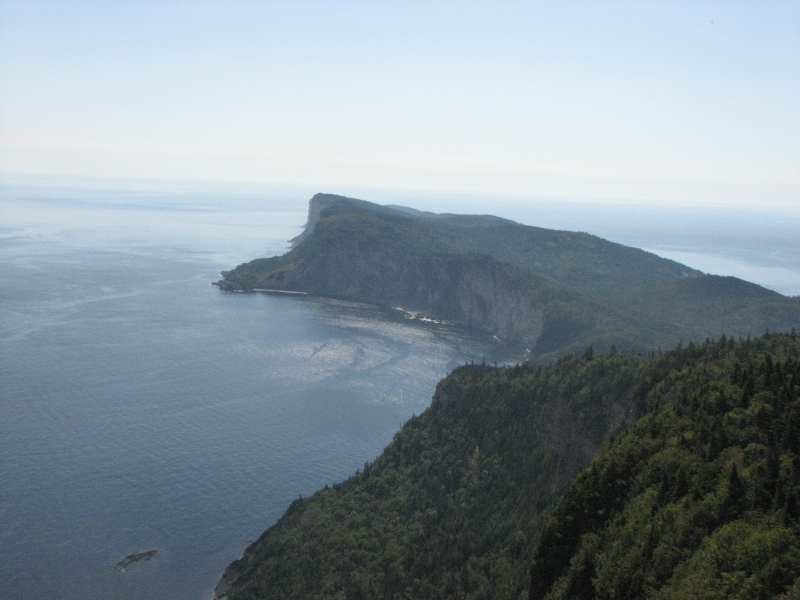 We decided to go ahead and do a hike out to Cap Gaspé, a peninsula that is the Quebec terminus of the International Appalachian Trail. 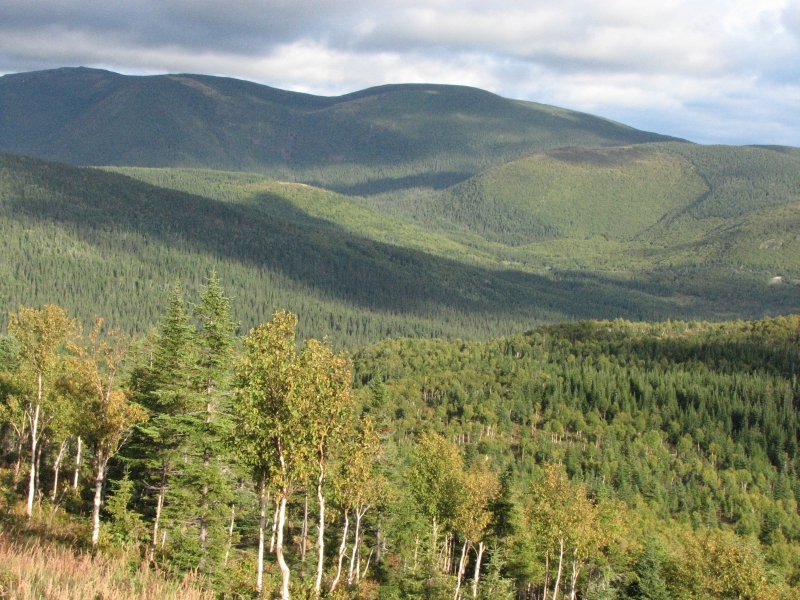 (The Appalachian Mountains continue into Canada, so a trail is being constructed through New Brunswick, Quebec, and Newfoundland that continues where the Appalachian Trail leaves off.) We walked a 7.2 km. loop, using an old road out to the lighthouse for one leg and the IAT for the other. It’s a nice easy hike, with frequent views out over the water. The cliffs are layered quite obviously and the sea is eating away at the base. The forest was dense spruce, cool and shady. 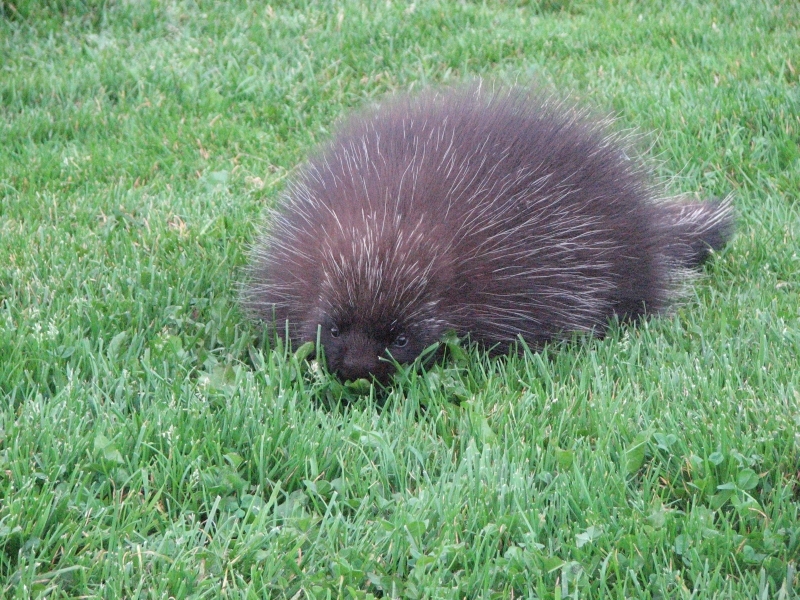 We passed a porcupine in the bushes, then saw another out by the lighthouse and a third on the road on the way out. At the viewpoint by the lighthouse, I spotted a whale, a dozen seals and 20 or more Gannets. On the hike on the way back we spotted more whales, seals and cormorants and some dark shadows that may have been porpoises. It was a good day. I loved seeing all that wildlife. I can’t believe we saw three porkies in one day! We got a nice site out at the campground. It’s flat, not far from the bathroom and surrounded by trees, so there’s a nice sense of privacy. I had planned to barbeque chicken, but it was so dark and threatening, I decided to hurry dinner, just in case. By 7:00 I had my headlamp lit, but the rain held off. It rained during the night, but we woke to sunshine, so we headed up the trail to an observation tower with 360 degree views of the tip of the peninsula. We climbed over 900’ through dense forest to the tower, but the views at the top were worth the effort. 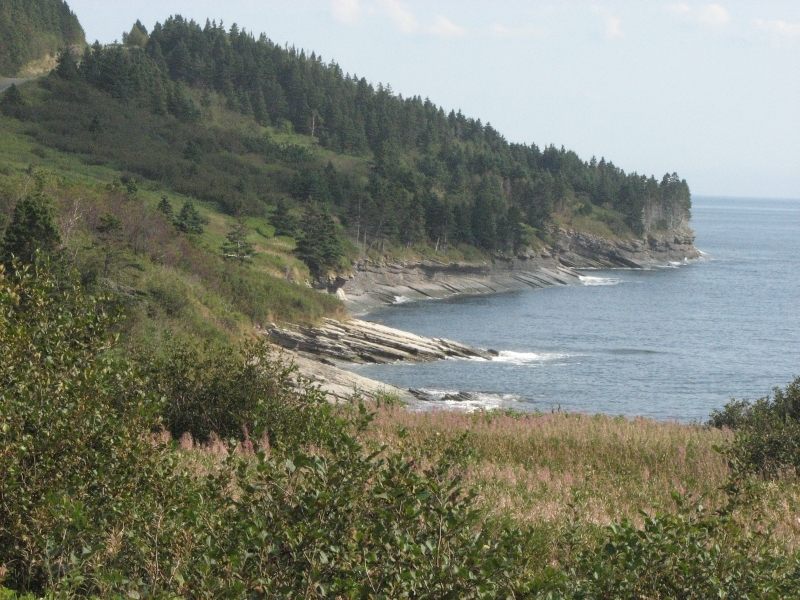 We could see the tall cliffs of Cap Gaspé, the blue water of the Gulf of St. Lawrence and the green forest atop the ridge. We are too early for fall color. Although a few trees are just beginning to show red or brown, most of the forest is barely starting to fade, much less change to autumn’s hues. 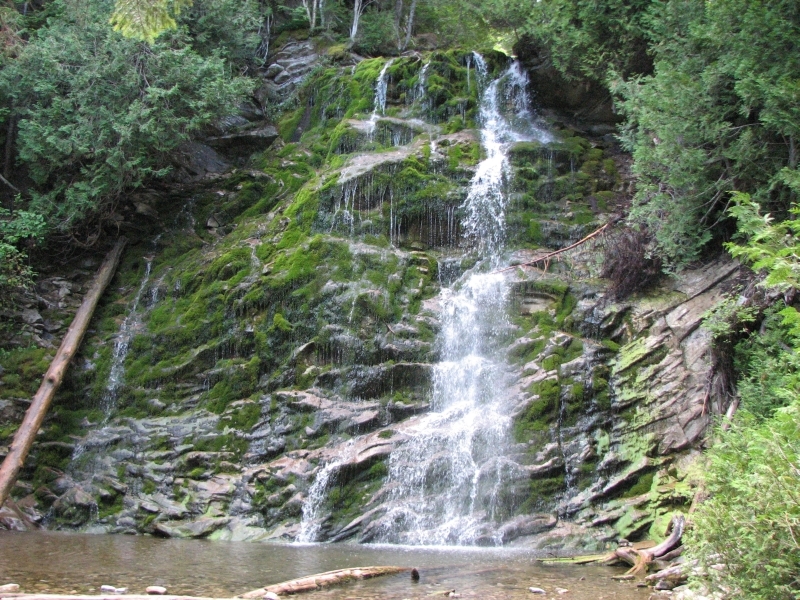 After our hike on the Mont St. Alban loop, we drove to the north side of the park, with a short halt to hike a one kilometer loop to a nice lacy waterfall over rocks covered in brilliant green moss. I liked it, though the stairs were hard on the knees. We stopped at the shore for a few minutes to look for wildlife. I saw one whale spout and one seal, but mostly we just enjoyed watching the gannets fold their wings and dive headlong into the sea. They really move fast. 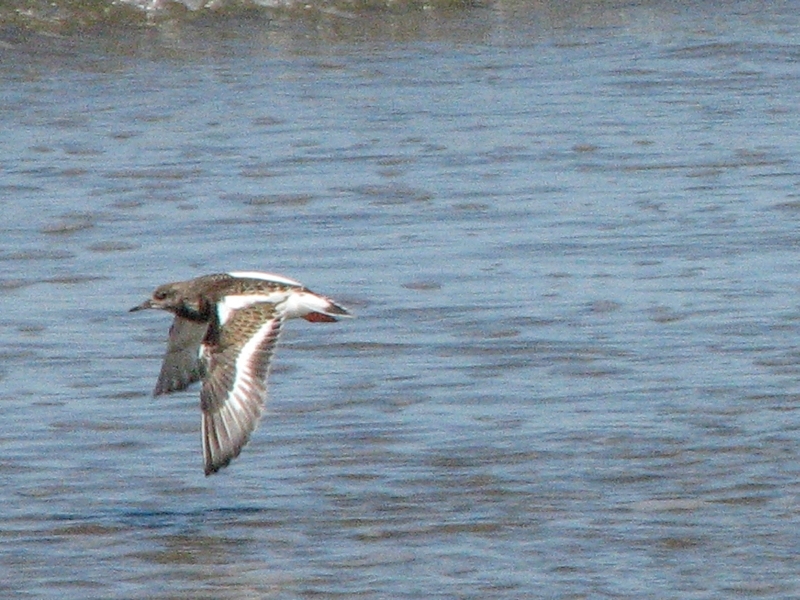 Later we saw a bald eagle and I finally saw a black guillemot. 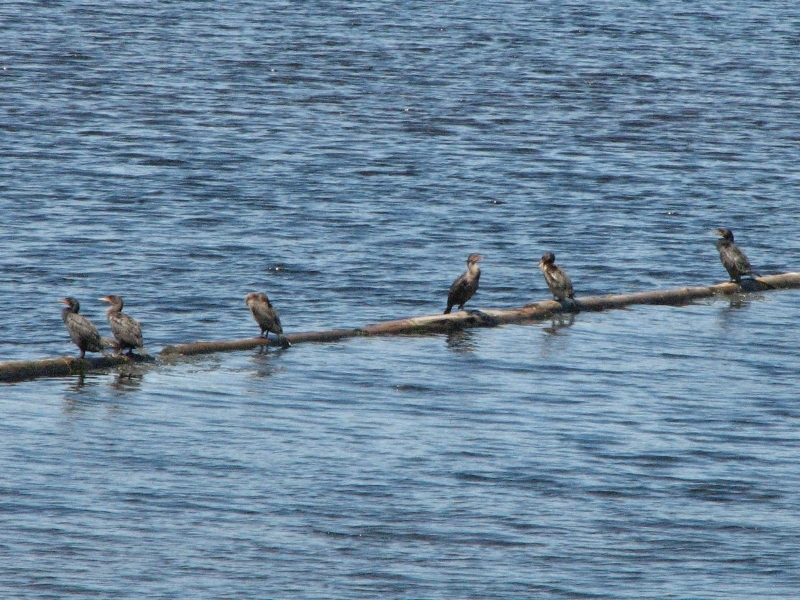 It was a really windy day, so most of the birds we saw were sitting on rocks. The waves were rough. The drive along the north shore of Gaspé was pretty, but slow. There are mountains to the left and blue sea to the right. Towns are scattered along the coast in the river valleys and coves. We criss-crossed the IAT a few times before it climbed into the high mountains of the interior. We stopped at St. Anne des Monts, a large town about 40 km. 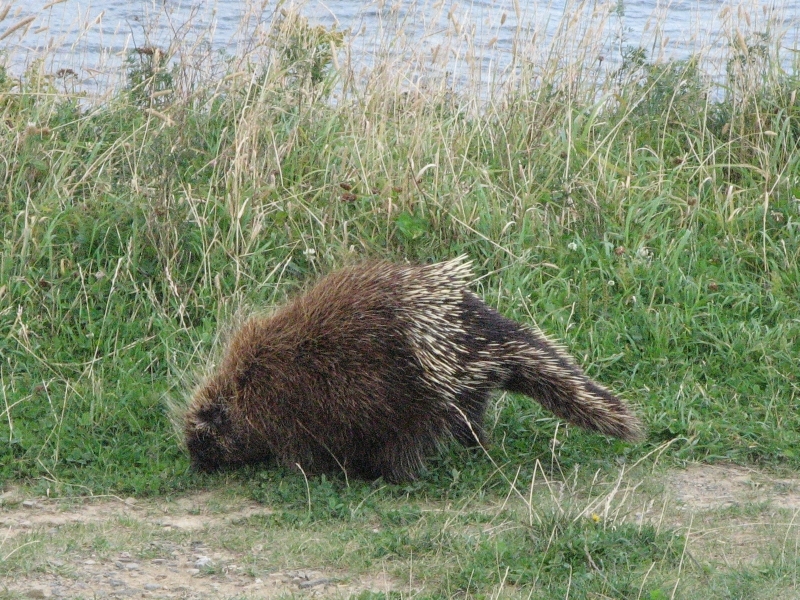 from Gaspésie National Park. We found a small campground, with just one row of parking spots along the shore. Because of the high wind, I didn’t want to cook, so we ate dinner in town, a very good cod, rice and salad dinner. The restaurant was recommended by the campground owner, and sure enough, it was filling and tasty. We caught the end of a nice sunset before hopping happily into a very hot shower. Although the forecast called for sunshine all week, we woke to dark clouds that looked pretty threatening. We headed into the mountains anyhow, but made sure we had warm gear with us when we began our hike. 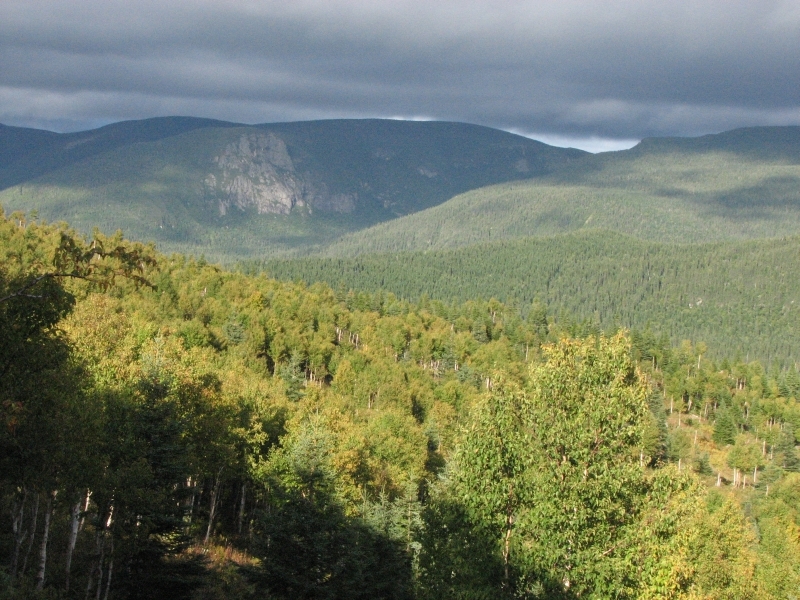 The trail we chose, Pic de l’Aube, was one recommended in the Gaspésie National Park guide and was featured on its cover. It turned out to be much easier than we expected, since the guide rated it as difficult. First we had to drive a graded dirt road 18 miles or so out to the trailhead. It was cool, only 50 degrees, when we started, but the climb soon warmed us up. We followed a jeep road/ATV/snowmobile path along a small stream in a narrow green valley. The climb was fairly gentle: about 1200’ in 3 ½ miles. We stopped near the top to check out a very nice cabin. It had lots of windows, a wood stove, 8 bunks, tables and chairs. Nice! 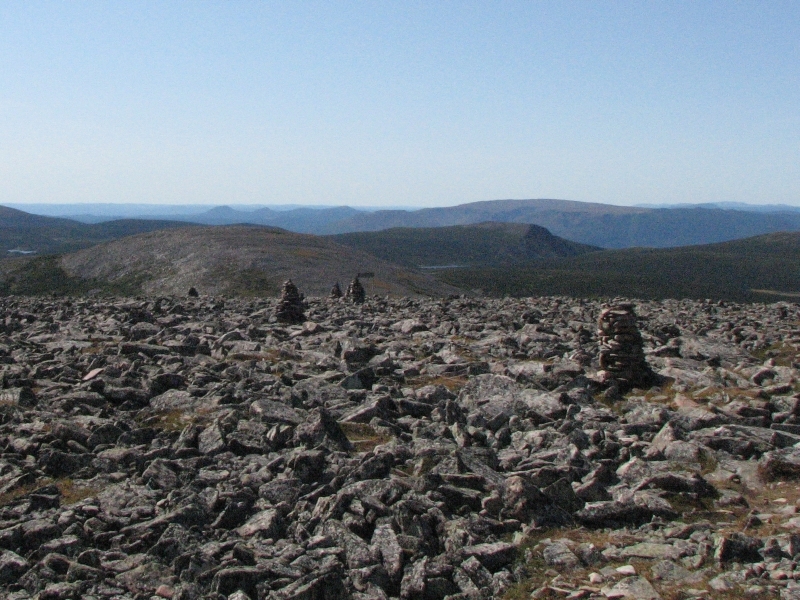 It was .7 km from there to the peak which was in the alpine zone. The view from the top was spectacular. 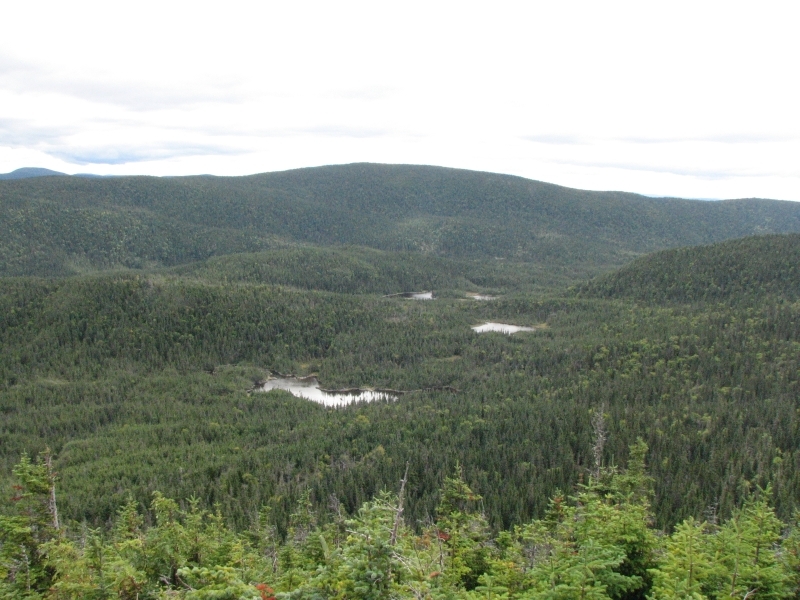 We could see a half dozen ponds below us, steep cliffs, miles of spruce forest. 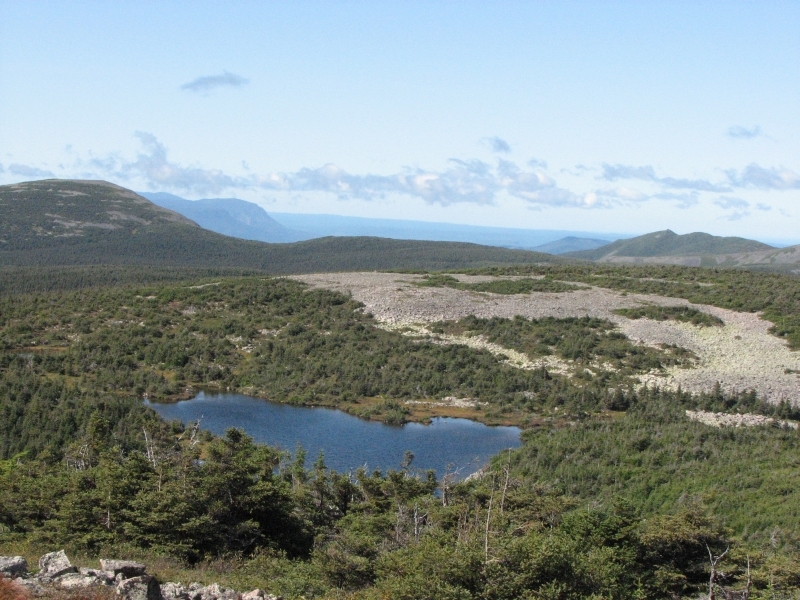 In the far distance, the really big alpine peaks and ridges for which Gaspésie is famous were visible. 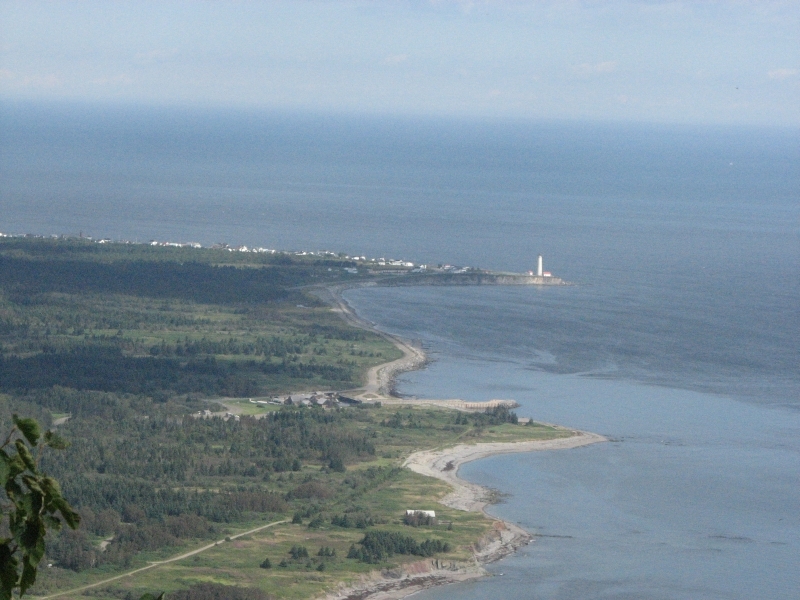 In the other direction, we could see the silver waters of the Gulf of St. Lawrence and the town of Ste. Anne des Monts where we stayed last night. We climbed Pic de l’Aube because it is off the beaten path and because the photo in the park guide showed the beautiful view from the top, but like most eastern hiking, it is a long climb through dense forest with no views in order to get to one good viewpoint. That’s very different from western or alpine hiking where the entire hike is scenic and views are more plentiful. Still, it was a good hike. We sat for a long time enjoying the view today. The sun appeared briefly so we were fairly warm, especially in our jackets and wool hats. We only saw one person at the peak; otherwise we had the trail to ourselves. I was tempted to follow the IAT the other direction down to the campground, but, given the uncertain weather, I decided to descend on the easier trail. We reached the truck at 2:15, so had time to head out to the Visitors Center. It was really busy and the parking lot there was full, but a lot of that was from people hiking up Mont Albert, a very popular dayhike. We talked to a ranger about the trails and reserved a site at a campground on the far side of the park (sight unseen; we’ll see how that works for us). 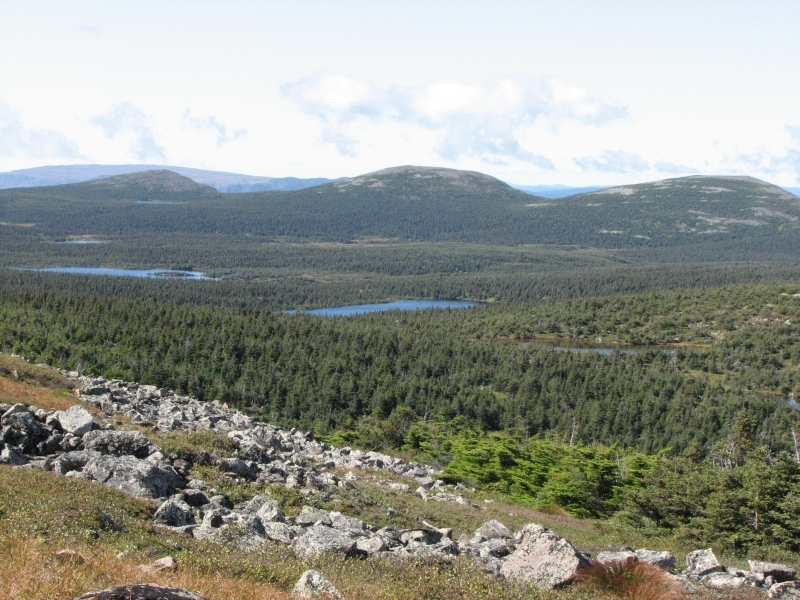 The warden recommended a short hike where we might spot moose and with 360 degree views, so we headed to Mont Ernest LaForce for another 4 ½ km walk. It was an easy 155 meter climb with beautiful views in all directions. The sky was still dark and stormy, so we hurried a bit, since we still had a 42 km. drive on dirt roads out to the campground near Mont Jacques Cartier. 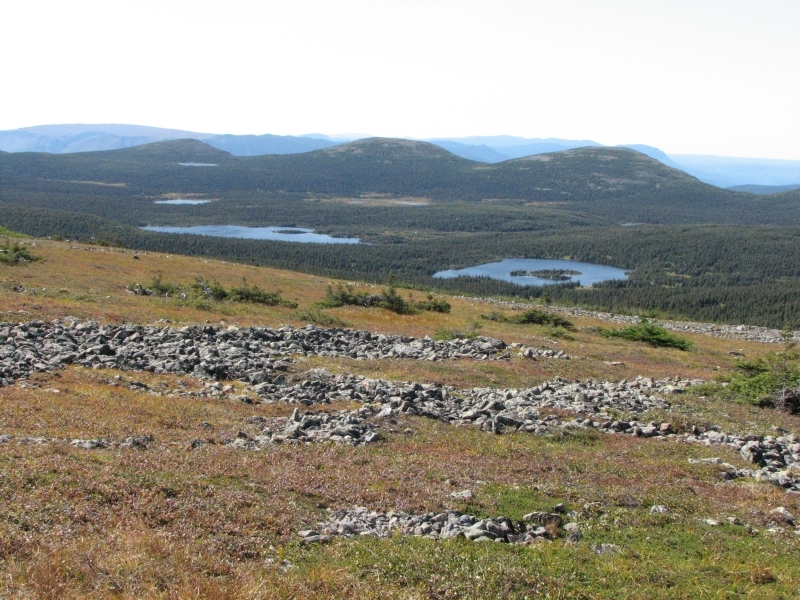 If the weather improves, as predicted, we’ll take the shuttle up to the trail in the morning so we can hike above treeline and look for caribou. Mountain weather is capricious, but we’re hoping for sunshine. Our two hikes showed us two very different sections of the park, the Chic Chocs and McGerrigle Ranges. No wildlife, but a lot of beauty. It was a great day. It rained yesterday evening, but once again we woke to blue skies and cool sunshine. Our hike up Mont Jacques Cartier was on! The Park restricts access to the mountain, presumably to protect the endangered caribou herd, by requiring climbers to use a shuttle service. Hikers are only allowed on top between 10:00 a.m. and 4:00 p.m. There are buses every ½ hour from 10:00 – 12:00 and returning between 2:15 – 4:00. You are supposed to be off the peak by 2:30. The restriction doesn’t do much to prevent the hordes from swarming over the mountain. Of course, everyone wanted to be on the first bus, so there was quite a line. Two buses arrived from the main Visitors’ Center at 10:00. One was completely full, the other mostly full. Only 14 of us were allowed on, the other 50 or so had to wait until the next bus. I was really unhappy about having to hike in such a crowd. There were at least 80 people on the two buses. We got a bit of a head start and managed to start the climb without having to wait for the people ahead. In a little while, the group spread out, but I still felt like we were in a parade. It is only 4 km. to the peak and an easy 1500’ climb. After about 2 ½ km. we were above treeline. The views were spectacular. It was a clear day, so we could see a sea of mountains in all directions and even as far as the Gulf. There were a half dozen sapphire ponds below us. We could see several other alpine peaks not too far away. 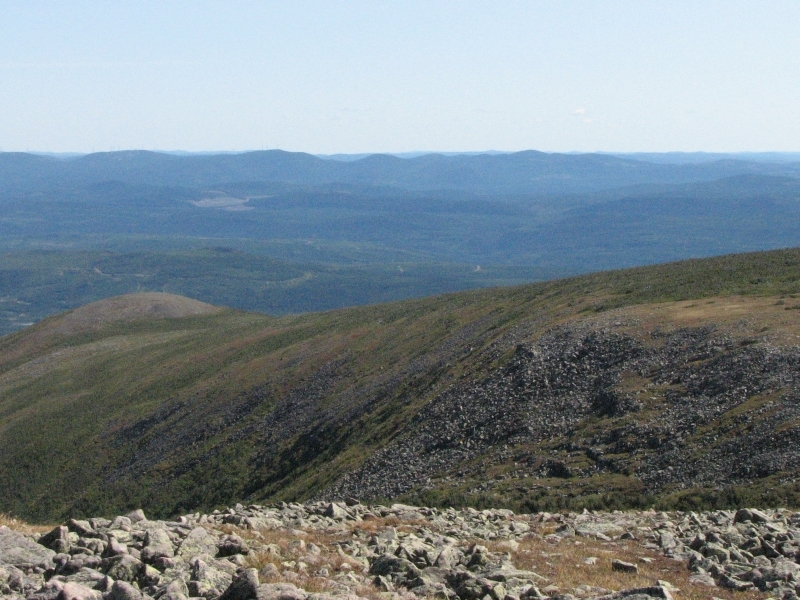 Mont Jacques Cartier is a lot like Mt. Washington in New Hampshire: rocks and more rocks. Yet there is life in the alpine zone. 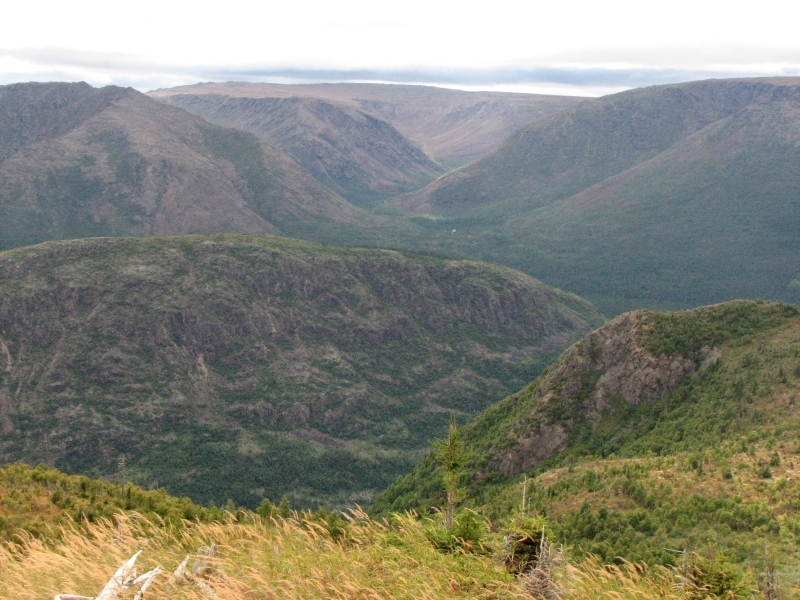 The Gaspésie caribou herd is about 200 strong, scattered over the three highest peaks in the park: Jacques Cartier, Albert and Logan. The caribou are very shy of people. I was afraid that with so many people, we wouldn’t see any wildlife, however, thanks to good eyes and binoculars, Jim and I ended up seeing eight caribou, in four separate sightings. Only one pair was pointed out by another hiker, the rest I spotted. None was close enough to photograph well, but at least we saw them. It makes up for missing the ones in Avalon. It was cold and windy on top of the mountain. We ate lunch in the lee of the observation tower, but it didn’t protect us much. On the way up, we did an extra 1 km. loop on the Caribou Trail (where we saw two caribou), which was a rougher trail than the main path, but it was in the trees and protected from the wind. It also got us away from the crowds for a little while, which was welcome. Our descent was slow on the rocky trail, but we got down in time to catch the first bus back to the campground. I really enjoyed our visit to Gaspésie National Park. All three of our hikes had incredible views, even with yesterday’s gray skies. I love being above treeline and getting the open vistas. Seeing the caribou made it even more special. We then drove a back road out to the highway at Mont St. Pierre, bought a few groceries in Ste. Anne des Monts, and decided to keep going a few miles rather than stay there again. We passed a large wind farm in Cap Chat. Across the Gulf, we could see land several miles away. 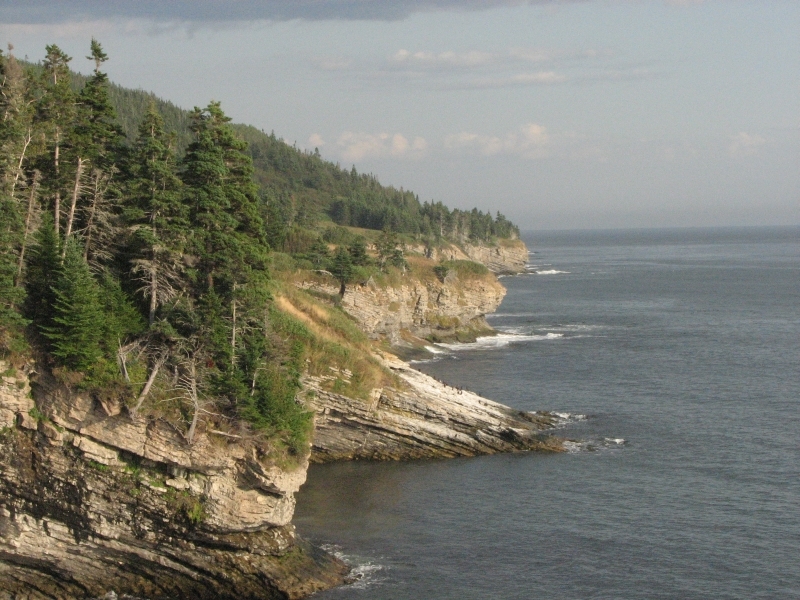 The Gaspé is a very scenic area, with mountains and beaches, salmon rivers and fishing villages. It feels odd to hear nothing but French, but it has been fun to practice it a bit. We ended up at a municipal campground in Matane beside the river. They are closing for the season tomorrow (Labor Day) so the campground is remarkably empty for a holiday weekend. I wonder if that’s normal, or a result of the recession? We were unpleasantly surprised this morning to discover that all the bathrooms in the campground were locked when we woke up. As we were leaving, I complained and was told, “But we close today.” My comment was that there were still people camped there and it was still early morning. Locking the bathrooms was not nice! But it did get us out of there in a hurry, which was probably the point. It took two hours before we found a gas station with a bathroom. Aarrgh! 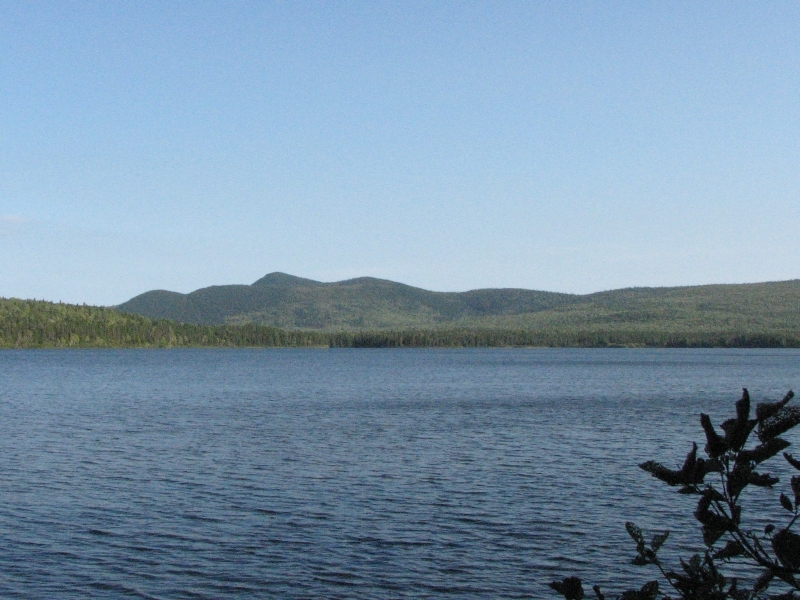 We drove south, leaving Quebec and reentering New Brunswick on the Appalachian Scenic Route. We passed through farm country and logging areas. The towns were still Acadian and most of the signs were still in French, not English. Mid-afternoon we reached our goal, Mt. Carleton Provincial Park. It is another park that is on the International Appalachian Trail and has several mountains with fairly short trails that climb to the peaks. Mt. 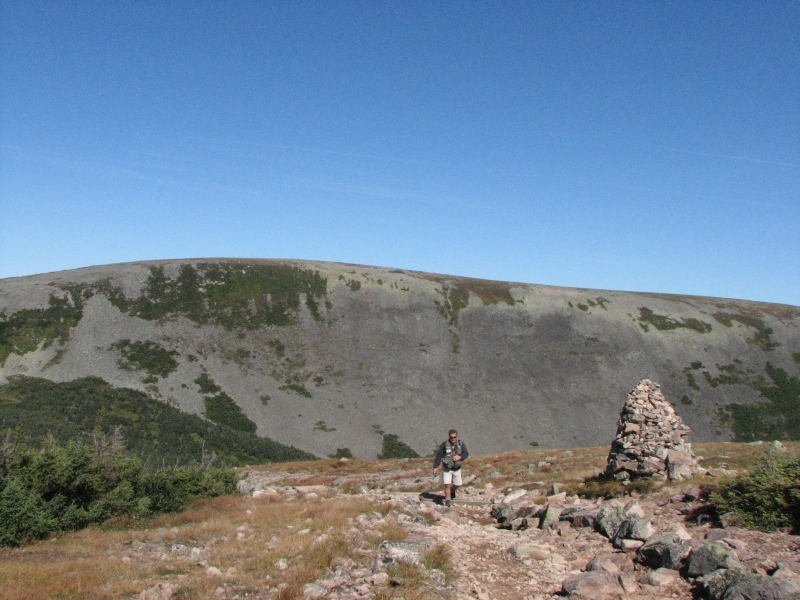 Carleton is New Brunswick’s tallest mountain at 820 meters. We arrived too late to do a real hike without pushing hard, so we found a site in the main campground, then drove the park’s narrow dirt roads to a small waterfall and then to a 2 km. trail around Pine Point, which juts out into one of the lakes. This park would be a good place to canoe, if we had one. The Park doesn’t rent them out, so we were out of luck. After our drive, I walked through the campground to the beach, spotted a deer across the water, talked with a local couple for a few minutes, then returned to the campsite to fix dinner. It is cool and breezy, a real autumn day. Only a few trees have changed color, but it is starting. I wish we had timed this trip better. In two weeks, this area will be gorgeous, with lots of red and sugar maples turning brilliant colors and contrasting with the green of the spruce and balsam firs. Another time perhaps. Jim: Crossing into Quebec was like entering an entirely different world. It’s interesting and somewhat amusing that Gaspesie is a Canadian National Park, but is billed as Parcs Quebec rather than Parcs Canada. Anyone planning on going to Quebec should also note that ALL signs and 99.99% of conversation in Quebec are in French. It makes life a little uncertain even if you speak French (Quebecois is not your high school type Parisian French). In fact, the language thing has been interesting – in Nova Scotia and New Brunswick, everything was in both French and English. Except for Cape Breton where the signs were either in English/Gaelic or English/Mi’kmaw. In Newfoundland, everything is English, while in Quebec, English is as common as Aramaic. 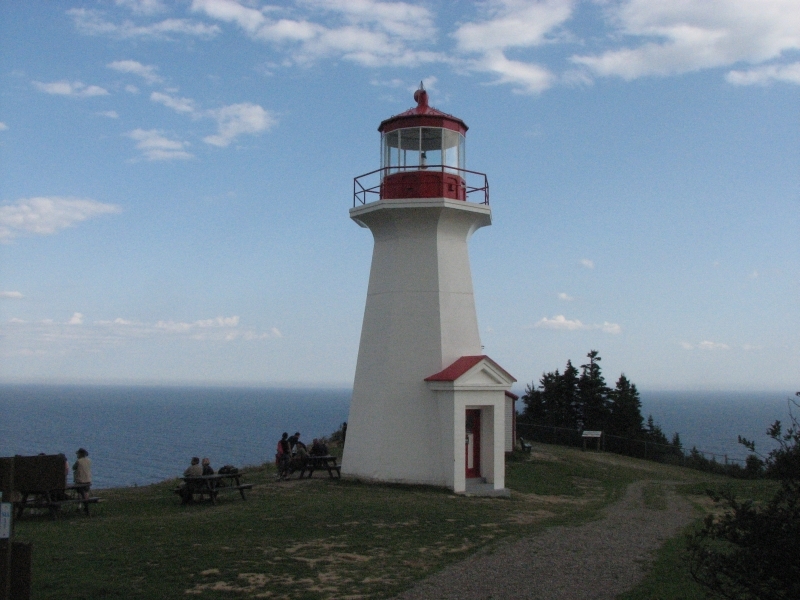 The Gaspe – and the Gaspe Point lighthouse at Forillon National Park became the beginning of our IAT (International Appalachian Trail) tour. 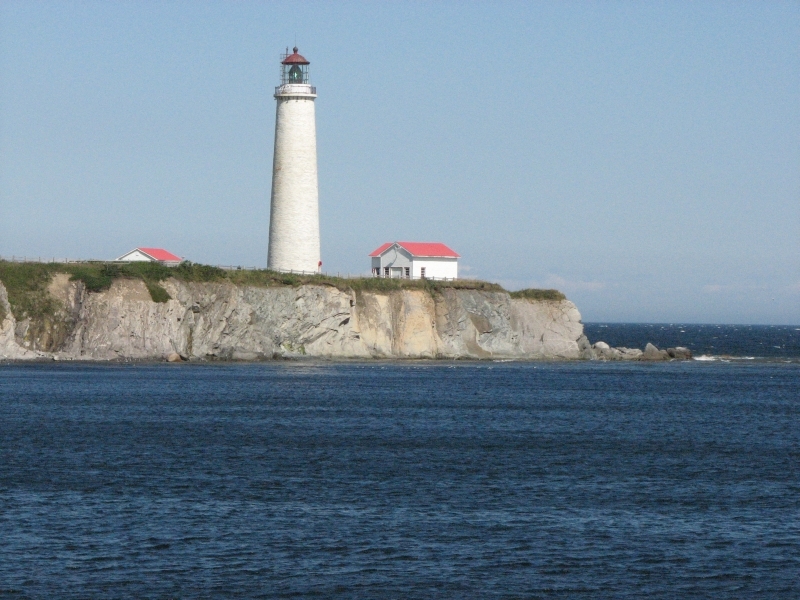 The lighthouse is the northern terminus of the International Appalachian Trail (IAT), which was the initial attraction for us, but there were also whales, dolphins and porcupines to make the l8 km walk interesting. Leaving Forillon, we drove the northern coastal road, with a left turn into the Parc National de la Gaspesie - a right turn would have gotten us very wet. We spent a day climbing Pic de l’Aube, then spent the next climbing Mont Jacques Cartier. That was literally a zoo – there must have been 200 people up there. Mont Jacques Cartier is only the second highest mountain in Quebec (the highest peak is in the Torngat Mts --- a long way north of the nearest road.) 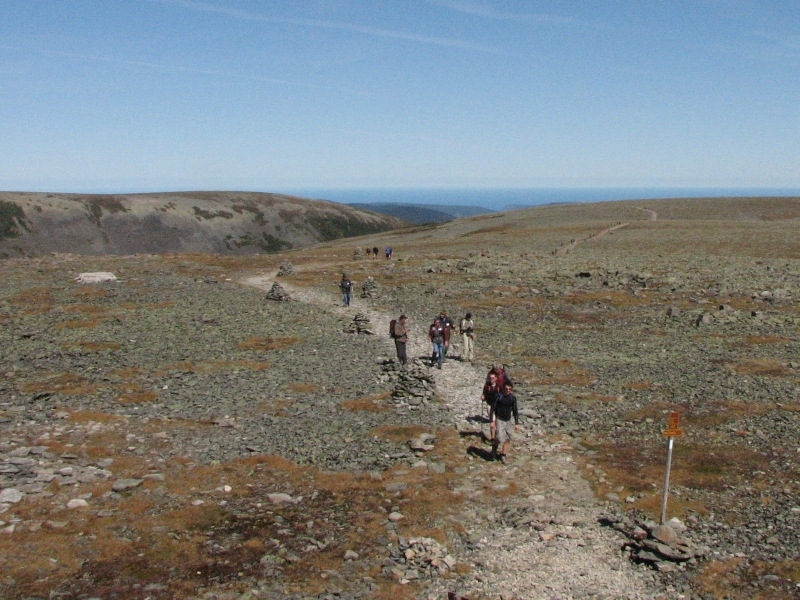 But Mont Jacques Cartier is also on the International Appalachian Trail (IAT) route - as well as being home to one of the three small caribou herds in the Gaspesie Park. 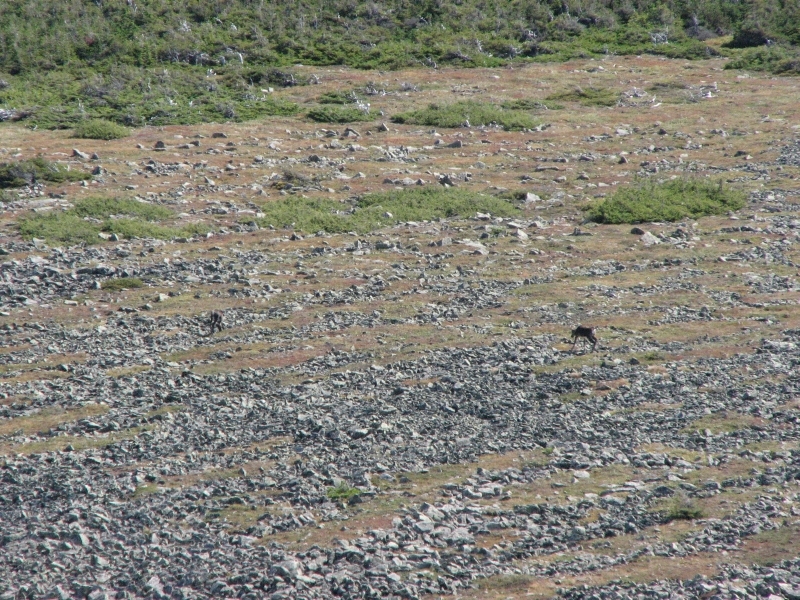 We were lucky enough to spot several caribou on the rocky plateau. 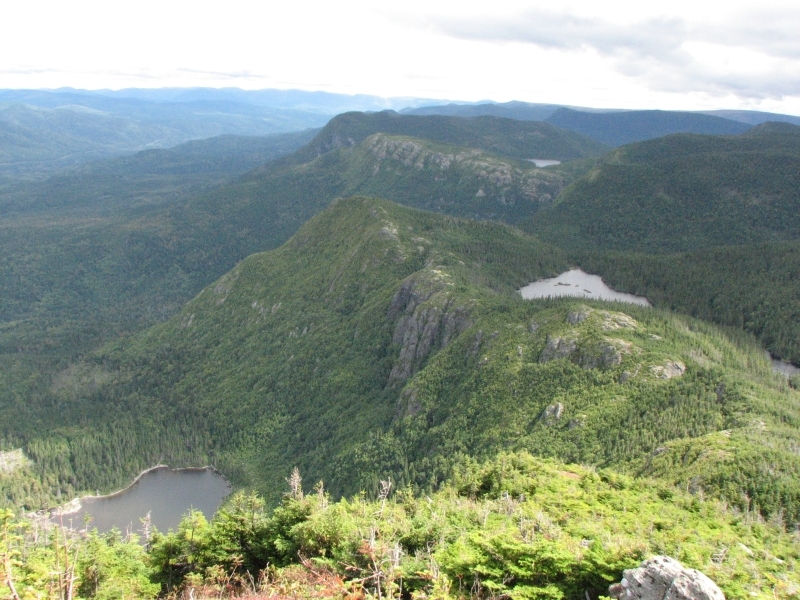 Our next stop was back in New Brunswick at Mt Carleton Provincial Park, where contrary to the zoo atmosphere at Mt Jacques Cartier, we were the only ones climbing Mt Carleton, which is also part of the International Appalachian Trail (IAT) route.